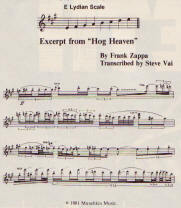 DO YOU BASE YOUR SOLOS ON linear progressions or boxy patterns? You must understand: I don't practice, I'm not accurate, and I just play what I imagine at the time that I'm doing the solo. 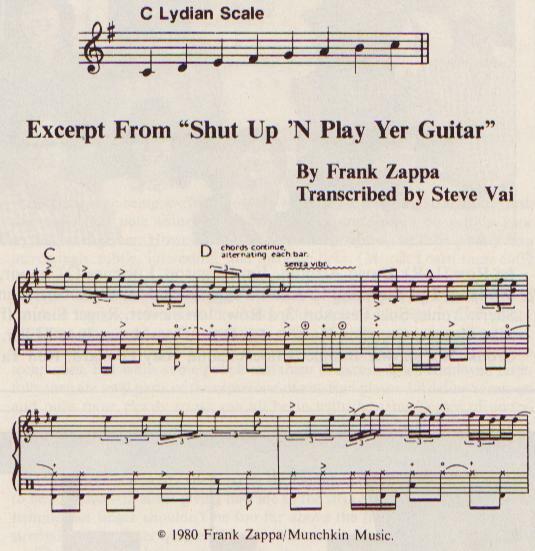 I mean, I listen to "Shut Up 'N Play Yer Guitar" now, and I can hear where I missed some of the notes going up, but you get the musical idea of what it's supposed to be. It's showing you a type of musical architecture. It's drawing you a picture. You know, it's the rise that's going up and then after that there's another part of it that comes down. It's drawing you a picture of something. Does it bother you if you miss a note? Well, I'm not going to commit suicide over it. I'm sure that there are perfect guitar players out there someplace, but I'll guarantee you they ain't going to play like that. I'll go out on a musical limb; I'll go out and try it. Why not? What have I got to lose? I'm not famous; I'm an unknown guitar player. Nobody's going to punch my scorecard the wrong way or give me brown stars if I screw up. Big deal. I'll take the chances. The rest of the guys that have the big reputations have to always play exactly in their style and do it right, and make sure it comes out perfect! What I do sort of sounds like the record. But usually what you get in other performances of guitar stuff on records is lacking in something. Vinnie Colaiuta has an expression; he says, "It has no garlic on it." You know, there's plenty of garlic on the Shut Up 'N Play Yer Guitar albums. They take chances and go out there and try things that polite society would probably rather ignore. 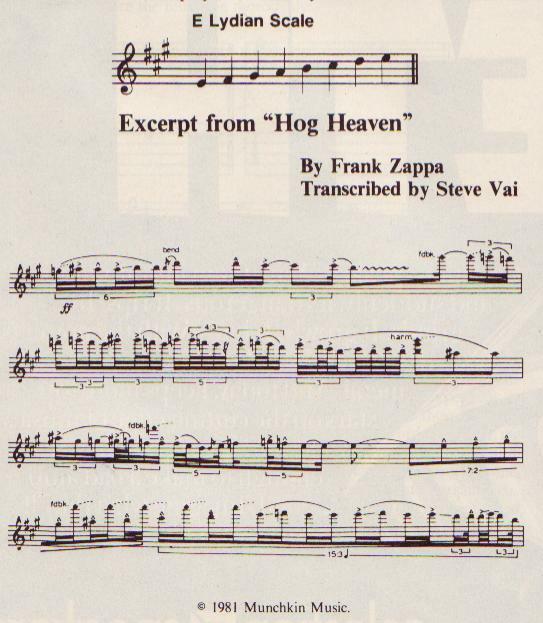 What was the basis for the solo in "Hog Heaven" [Shut Up 'N Play Yer Guitar, Barking Pumpkin, BPR 1111]? It's just an improvisation. It's communication between me and the drummer and the bass player. It's in E lydian mode. Do you generally think in terms of modes? No. This just happened to be in a mode. The tonality is E lydian, although there are a few deviations. 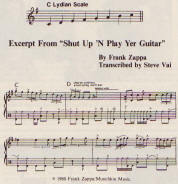 What kind of mode did you use in "Shut Up 'N Play Yer Guitar"? Basically, it's C lydian. I was just playing what was in my imagination at the time that it was happening. I didn't have a strict part worked out at all. I don't practice solos or anything like that. I just go for it. Your solos are often built over vamps. Right. I don't like chord changes. I like to have one tonal center that stays there, or possibly with a second chord that varies off the main tonal center. And then I play around that. I don't know if you ever listen to Indian music – there are no chord changes in that, but you can hear implications of all kinds of other chord changes and lines that are played against each other. That's the way I like to work. There's a little four-note vamp in "Treacherous Cretins" [Shut Up `N Play Yer Guitar] that implies Dm and A chords. It creates a harmonic climate. I don't think of them as a chord change. Instead, I look at the whole as a harmonic climate or harmonic attitude that sets up a mood – the combination of the alternation of those two chords. And so I just play inside of that attitude. Do you think of the two chords as separate entities or as one massive chord that contains all the notes of the two chords? Both ways. You can play against them both ways, because they're alternating – they never really happen at the same time. But you can play lines that include the notes of both chords. You get to play C sharps and C naturals in that way.